Progress continues apace. He is a talking machine. He probably knows more than 100 words. He learns words after you say them two or three times, and then he remembers them for good, as far as we can tell. They are mostly food words, animal names, and people’s names. He still stays hello to most people we pass on the street. He’ll sometimes say a word a few times in a row, each time saying it more clearly, as if he’s practicing. We set up the computer in our living room so that its screensaver shows random pictures of animals from Flickr. He likes them and can name a lot of the more interesting ones. He’s pretty good at generalizing, too, so he can sometimes even correctly guess the really weird looking ones. Fulltime daycare, which we started about a month ago, was a little rocky at first (he would sometimes grab papa’s legs and cry when dropped off), but he made his first friend there, Mischa, who is 2. Mischa is Byelorussian, and speaks Russian, so Guthrie picked up “da” for “yes” from him. The daycare lady has three kids of her own and seems to adore Guthrie as much as she does them. 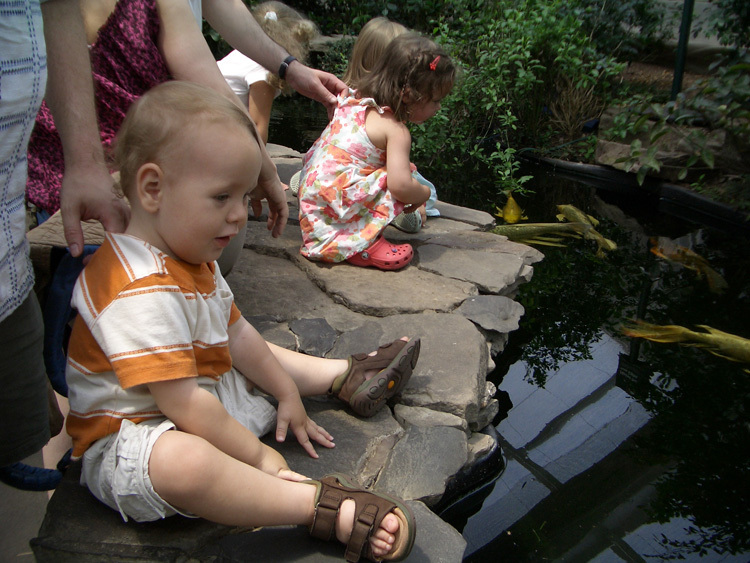 Guthrie walked around for the first ten days or so calling every kid “Mischa” and saying the name in an inquisitive tone, apparently wondering when he would see his friend again. The boy is very social and loves playing with the other kids. At daycare he will even lay down on his nap cot and go to sleep without a lot of hassle, especially if there are other kids nearby. Grant says: I now know what my mother meant when she used to say, “You don’t act like that at home.” He is indeed different for Tanya, the daycare lady. She was delighted to tell us that he had started saying, “Mine! Mine” but a bit crestfallen when we told her he had been saying it for months—he just wasn’t saying it around her. He is a fiend for steps. Up and down, up and down, up and down. He likes to climb things on the playground. He loves the swings. You can make him giggle by pushing him very high or else rushing up to him on the swings from far away as he swings towards you. He likes to wash dishes and his hands. 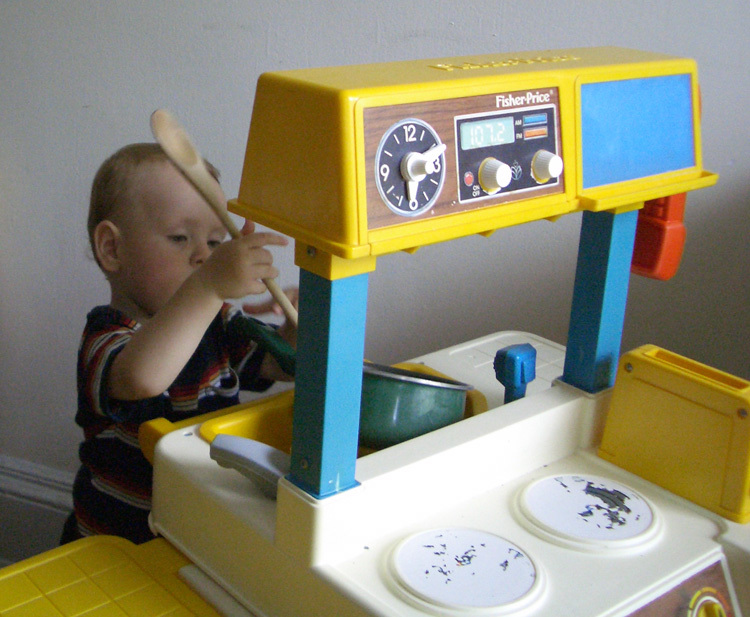 Mama found a discarded toy kitchen set on the side of the street one day, so she lugged it home (many, many blocks, while also carrying boy), Papa scrubbed it off on the shower, and the boy has had a grand adventure with it ever since. 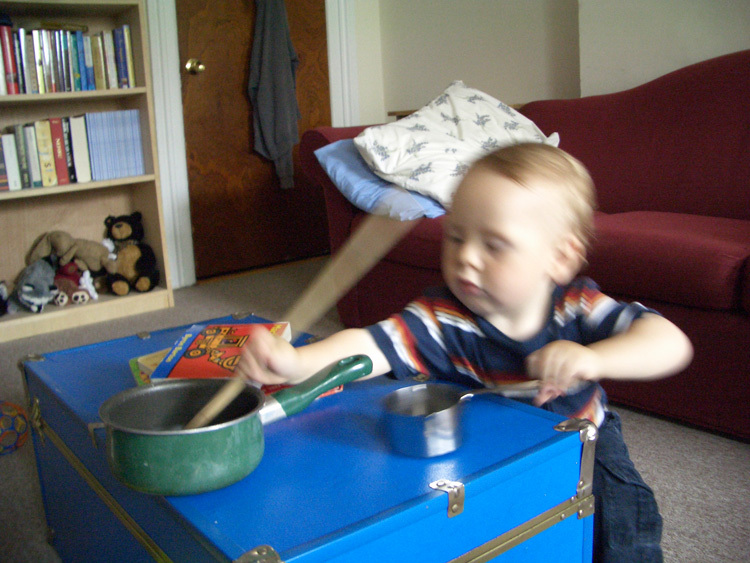 He makes beeping noises when he puts stuff in its microwave, he moves his pots around (mostly big metal measuring cups we bought just for him), and constantly—continuously, it feels like—stirs everything with short little stabby motions of his “poons.” Sometimes half of our dishes to be washed are serving spoons, spatulas, tongs, wooden spoons, etc., etc., because he constantly wants them and we later gather them up in bundles from where he has left them on the floor. In the mornings and evenings, or whenever he thinks of it, he likes to shout, “wash, wash” which means we have to go to the kitchen, pull the step-stool up to the sink and let him play in the water until he’s bored of it. He’s rarely bored of it. Especially if there are bubbles. We started casual potty training a few weeks ago. He thinks it’s a lark, but he’s only left peepee in it in the morning, never at night. We read him books and blow bubbles and try to talk modestly about his urinating successes instead of going overboard with the praise. Don’t want him to get any complexes or fetishes from Mama and Papa getting carried away. Since the boy started daycare, Mama says its almost as if the boy only poops on weekends, since he’s mostly a daytime pooper and tends to drops his crott in his diaper for the daycare lady to pick up. He likes lotion on his belly button and on his feet. He’ll ask for it. He’s now grown used to the shower sprayer hose (and can say “hose”) and likes to try to get Mama and Papa with it. At first he was afraid of it, but we slowly introduced it because it makes rinsing the sweaty, dirty boy more thorough and it makes bathtime much faster when it needs to be. He likes the feel of it spraying his belly. He’s still a little timid of the sprayers at the playground, but he likes it if Papa holds him (both fully dressed) and they run through the sprayers together. Last weekend he went swimming for the first time. He acted like it was perfectly ordinary. 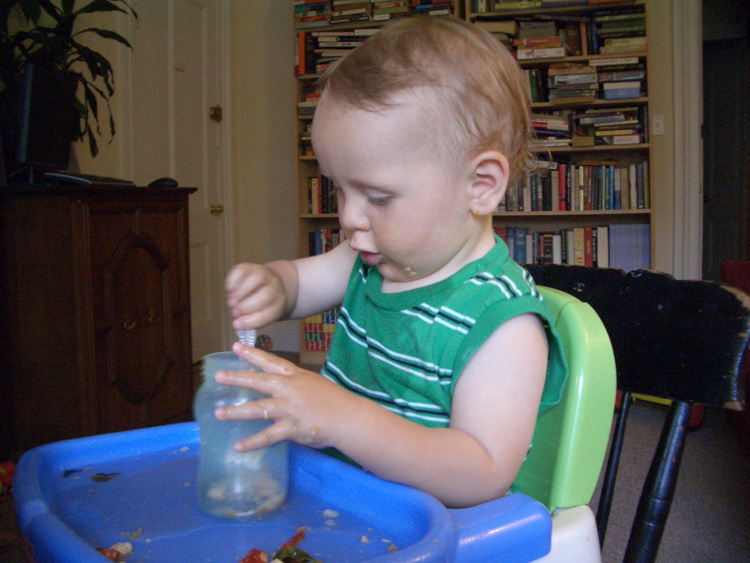 His fascination with water and pouring it from thing to thing was only heightened, not sated. He did take a couple of accidental face dives into the water, but he recovered quickly. He also likes being in his bed (his play yard). “Guthrie’s bed,” which he knows by name, is a special place where he has his stuffed puppy, his stuffed rat, and his elephant pillow. He’ll lay down and make little hissing noises as he pretends to sleep. He will not—yet—lay his head down there and go to sleep for real. We are slowly weaning him off of breastfeeding in preparation for a trip that Mama will make to the UK for work in September. The boy and papa will stay in New York, so the boy’s boobie addiction will have to be cured, at least temporarily. He likes music and will ask for it to be turned on, which is fun. He likes broccoli, and will ask for that, too. We give him as much as he will eat. Same for the spinach pancakes, and the fruit, which he can mostly name, though a lot of it is lumped under “apple,” except for “peach,” which he mostly gets right. Likes cucumbers, too and will ask for them. And bread, and pizza, and raisins, and crackers, and Veggie Booty. Putting a name to things, as far as he is concerned, is a way of ordering and controlling his diet, so he takes full advantage of it. 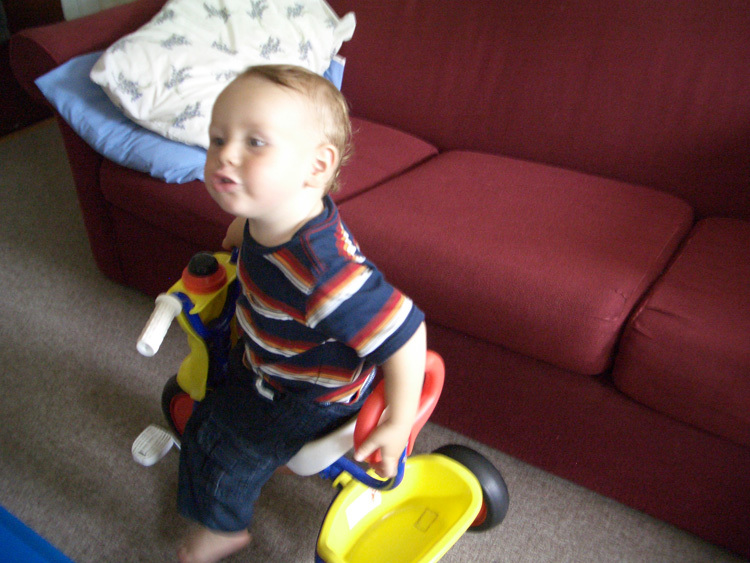 The first photo below is typical for the boy. He likes to put his food in his drink. I tell him he’s like his Poppy putting his cornbread in his milk. 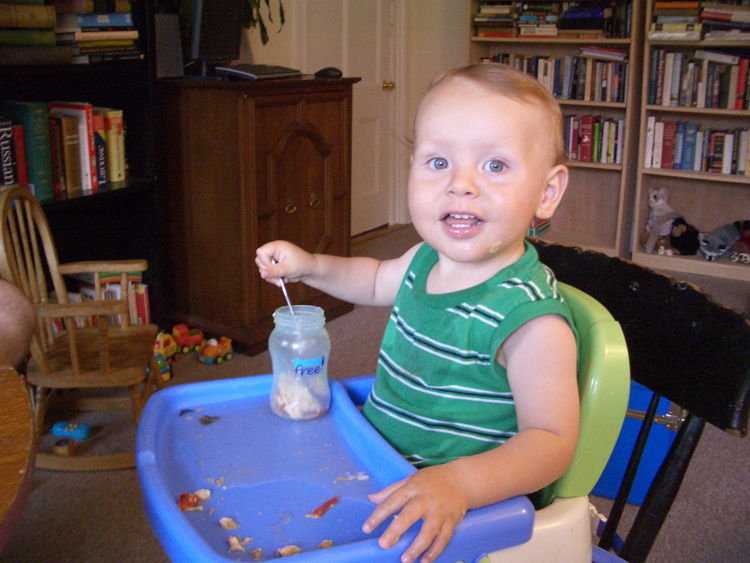 In this photo, boy has pizza in his bottle. He will then eat it. 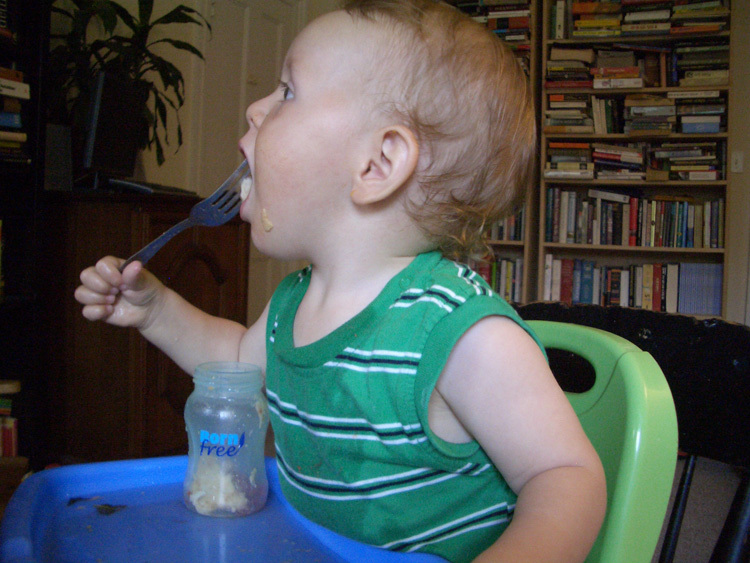 We reassure ourselves that he’s normal because when he does these horrible things with his food, he does them using forks and spoons, like a civilized person. 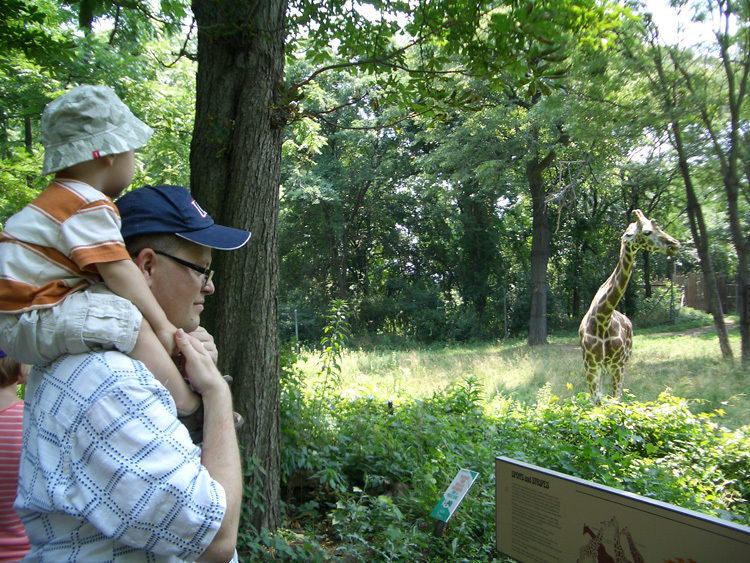 We went to the Bronx Zoo! They have a bug carousel. We rode a grasshopper. 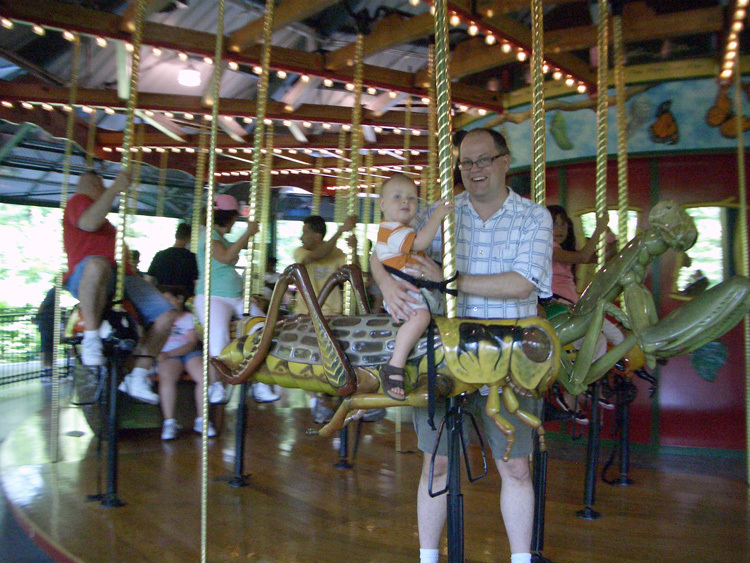 He loves the carousel. 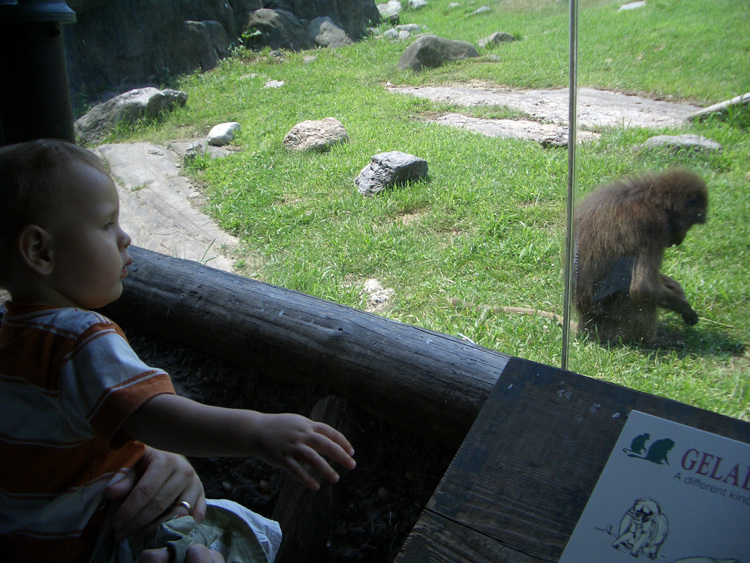 Ever since Mama first took Guthrie to the Prospect Park zoo, he has loved the word “baboon.” He may even love baboons, we don’t know. He certainly says the word enough. Everything is a baboon. Animals he doesn’t know, people in the distance, random objects. He does it at daycare, too. For months, it has been our morning ritual to look out the window of our bedroom onto the trees and yards below and search for baboons (or “baboots” as it sometimes comes out). He’ll insist, Papa will lift him onto the radiator so he can see out the window, and we’ll search. We’ll usually see birds, squirrels, and workers building a four-story red brick building cater-corner from us, but not baboons. We think he thinks there are baboons out there because at the zoo the baboons are behind glass—on the other side of a window—so why wouldn’t they be on the other side of our window, too? In any case, here is the boy with a real baboon! He was delighted. Baby gorillas fighting. Our future should we have another child.